93% of companies use a blog and 74% say a blog will be most critical to their content marketing success in 2017. When done properly, your business blog will drive traffic to your website, increase sales, establish you as an authority in your field, improve your SEO and give you access to new markets. What do I want to achieve from my blog? What do I want my readers to take away from it? The answers will enable you to set core business goals for your blog. The goal of your blog should be to educate your readers, not promote your company; however your overall business goals are to generate sales and make a profit. So, how do you reconcile the two? The trick is to remember that you’re targeting people at the pre-sales stage in the sales process. Before buying a new product or service, customers will shop around, weigh-up options and decide which choice is best for them and whether they want to go ahead with a particular purchase at all. More equipped to make the right decision about which product is best for them. Feel more confident about using your product or service, regardless of where they eventually choose to purchase it. Feel that they can trust your website as an authoritative source of information. Or with some blog posts, simply feel that they’ve received a gift and learnt something that helps them towards the same overall goal. When writing a blog, therefore be generous and be abundant in the information you provide. Read more on why educate customers in your blog? You can’t have a meaningful dialogue unless you know who you’re talking to, and remember: you’re writing for your audience – not yourself! If you interact with your clients physically, e.g. you run a health centre or a restaurant, then you will have a good idea of who they are from meeting them. If not, or if you have a new business, then looking at your followers on social media can reveal a lot about your customers, but your website statistics will be your primary source of information on who your average visitor is. When reviewing Google Analytics (my preferred website statistics software), I focus on statistics that have clear differentials. If 45% of my audience are male and 55% female, it’s clear that I should target both men and women. It’s important not to inadvertently overlook a large minority during this process. Customer personas are used by 50% of UK companies according to a 2017 survey by the Content Marketing Institute. Create 1 or 2 of these that reflect who your customers are, then when you’re writing your blog, keep these customer personas in mind and write for them. If you work with a marketing or SEO company, then pass this information onto them too. What other information will help your customers solve this problem? What do your top competitors write about in their blogs? What other questions or goals will customers looking for your business also have? Learn more on writing for your target audience. Joe Pulizzi, Founder, Content Marketing Institute. What is the best service for me? (A comparison between two or more different options). Detailed guide on how to do something (can either be one aspect of your business, or if you have a niche business, can focus on how your business fits into a wider sphere of interest). Success story from someone who has used your company or a case study based on your own success or how you overcame a past failure. Describe an event (if you attended a business fair, speaking event, etc. then talk about it). Doing keyword research is also a useful way to identify what to include in your blog and how common different search phrases are. There are often a significant number of people who enter the same exact question into Google and it’s best to consider including the exact wording as part of the blog title to help you appear higher for this question, so long as you add something to it to make it unique and help increase the Click Through Rate. If your business is an established, well-known brand, then it would be natural that your blog will be more about your own company, events, product launches, etc. If your business is smaller, then it’s more natural to write about the industry as a whole. Remember to keep your blogs relevant, upbeat and educational and/or entertaining (if appropriate). Bloggers who write over 1,500 words per blog post are 3 times more likely to get “strong results” than bloggers who write less than 500 words. (From a survey by Orbit Media in 2016 of over 1,000 bloggers, who also found that the length of blogs is increasing and is expected to increase further in 2017. Put yourself in your visitors’ position. Can you truly answer a question in-depth in just 500 words? Can you do it better than any of the other websites out there that are also answering this question? Both your visitors and Google value more in-depth blog posts and writing fewer, more in-depth posts will generate far better results than churning out short posts every day. If you have limited time, a single monthly, high-quality and well-researched blog post is better than lots of small posts. It’s all about adding value. As with any piece of writing, a blog post can be split into 4 components: Title, Introduction, Body and Conclusion. Use a short h1 title that appears at the top of the page that succinctly describes the blog. Use a longer (40-60 characters) Metatag Title that appears in the search results. The reader should feel excited about reading your blog post and look forward to reading the whole thing. Discover more on writing blog post introductions. Before starting to write your body, research the topic, brainstorm the sub-sections to include in your post and consider the best order to put them in so that they flow naturally. Relevant and attractive images (I like to start each blog post with an original illustration and include some other images in the post that can either be illustrations, photos, charts or diagrams). Bullet point lists (a good way to use these is to ask a question, then list the answers). Secondary sub-headings to split up the main sections. Links to other relevant pages on your own site or blog pages on other websites that provide extra information. For best SEO practice, main sub-headings should be h2 in html and secondary sub-headings should be h3. If you use ‘Heading 2’ and ‘Heading 3’ formatting in Word, when you copy it to your website, most modern CMS editors will automatically change it to the right format. For SEO it helps if some sub-headings include keywords, but it’s more important that they make sense to readers, clearly describe the topic, and engage them. Each sub-section can include its own Title, Introduction, Body and Conclusion. While I like to conclude by summarising the main points, the conclusion is also where to put a call to action – a chance for readers to start a new beginning. A link to a product or service page (e.g. would you like to appear on other people’s blogs? Learn more about our guest posting service). A link to your contact page (e.g. if you’d like Indigoextra to write your blog for you, or for a no obligation discussion on improving your SEO, please get in touch). An invitation to comment on, or share your blog. Bloggers who follow a formal review and editing process, particularly those using a professional editor, also report more success. Does it make sense and flow naturally? Is there anything that reads like a filler? Should you delete it? Is there anything essential that’s missing on this topic? If so, either add it, link to someone else’s post that provides more details, or make a note of it for a future post. Is the title still the best fit for the content? Edit anything that needs changing and ideally ask a second person to review it too. So, you’ve finished your blog, job done, time to put your feet up and relax! Review other pages on your own site and add links to your new post from old pages or product/service pages where it makes sense to do so. Share your blog on social media. Write another blog post on a related theme linking to your blog and arrange for it to be posted on a third party website as a guest post. For companies with a new blog we recommend that you spend 1/3 of the time writing your blog and 2/3 of the time marketing it on third party websites. If you have an established company blog, then the ratio changes – spend 2/3 writing content and 1/3 marketing it. The way SEO works is that a link to a page on your blog will help your website as a whole. Pages that are rich in information and useful for visitors are far more likely to get shared, liked and linked to than your product pages, unless you create something that people rave about; therefore in the long run creating great content on your blog is also one of the best content marketing strategies. A successful blog for a company takes time and effort to create, however when you write a blog that truly adds value for your customers, it will significantly increase sales and improve your branding. There’s a reason why the most successful companies all write blogs and it’s not just because everyone else does it, rather it’s based on a solid understanding of business. Focus on creating high-quality, in-depth content, on what your customers need and on what you can give to them. 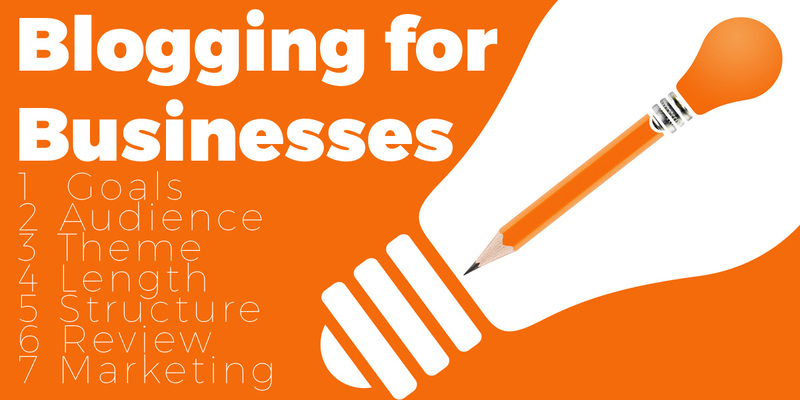 Writing a business blog can be a great pleasure and is rewarding both personally and financially. If you’ve found this post useful, please share it.